Her business is good, her motto is �Eat sweet and thin,� but life is not all sweetness for the beautiful �Candy Queen,� Claire Armstrong. Mark Chester, Claire�s boyfriend, has stolen her inherited candy formula to pay back his gambling debts. [SPOILER] Her cousin Wanda helps frame Claire for murdering blackmailer Harry Arnold. This sticky case is one of Perry�s favorites. This is the time where he investigates Claire's candy factory, nibbles for clues, and has the real murderer eating out of his hand in the courtroom. And remember Paul trying to give Claire a box of candy at the airport to impress her? Suggested Correction to Summary Paul gives Claire a box of candy shipboard, not "at the airport". jfh 08Mar2017. This episode of Perry Mason (TCOT Candy Queen) and the first season episode TCOT Silent Partner (#6, 1.6) are both based on the same Erle Stanley Gardner novel titled The Case of the Silent Partner. So this current episode is often considered to be a "re-make" of the first season episode TCOT Silent Partner. See repeated episodes here. Submitted by Charles Richmond, 26 April 2013. Uncredited Actors: Once more Don Anderson appears as a plainclothes policeman. Though he has no lines, he's right behind William Boyett in the raid on the gambling house. Don and two uniformed men actually apprehend the Candy Queen fleeing from the murder room. Submitted by FredK, 11 January 2011. + It�s difficult to miss Arthur Tovey, King of Extras, sitting behind William Anderson in the courtroom gallery. He�s the lean, placid elderly gentleman next to H.M. Wynant. (We don�t have him on our Uncredited Actors page yet, but perhaps soon�) Submitted by gracenote, 5/11/2011. Irony: Patricia Smith played Wanda Buren in this episode. 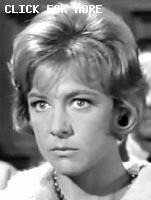 �TCOT Candy Queen� was the *only* Perry Mason episode she appeared in. The irony is: Patricia Smith was a diabetic. She battled diabetes for 65 years until her death of a weakened heart in 2011. Submitted by Charles Richmond, 8 March 2011. Stalled in his Hollywood career, Kenneth MacDonald wrote a pamphlet entitled "THE CASE OF KENNETH MACDONALD" and "distributed it to as many producers as he could. The ploy worked; he started getting jobs at most of the studios...He is probably best remembered as a foil for many of Columbia's comedy teams...particularly The 3 Stooges [IMDb]." That website states that he presided in 32 PM episodes (11.8%) from #2/"Sleepwalker's Niece" to 271/"Final Fade-Out." Mike Bedard 2.10.15. Perry must have anticipated a short day in court. He parked in a 2 hour parking zone in front of the courthouse. Submitted by Kilo 1/19/2018. > We've given nicknames to many of the background characters, should we do the same for the sets as well ?? If so, I'd like to suggest this one be labelled the "Candy Queen Anne Cottage". Advocated by Notcom, 080218. This episode is essentially a remake of episode #6 (TCOT Silent Partner). It changes some of the details (candy business instead of orchid business, etc. ), but the major plot points are all the same. I prefer #6, myself. Submitted by Ed Zoerner, 8/29/09. This is one of the few episodes from the last several seasons that occasionally recaptures some of the noirish undertones that were largely lost near the end of the show's run. For example, the scenes outside Harry Arnold's gambling joint and Wanda Buren's apartment harken back to the first several seasons' somewhat grittier, noirish Los Angeles, depicted even more effectively in Episode 6 ("TCOT Silent Partner"), mentioned above by Ed Zoerner. Submitted by BobH, 14 July 2016. Funny reaction (IMHO of course <grin>): Paul is calling �the poisoning� into the police and he seriously/somberly says that she is in real bad shape, then suddenly gets very happy (and smiles big) as he thinks he recognizes the voice on the other end, and says �Is that you Steve?�! LOL! Submitted by mesave31, 02/16/15.